In my early 20’s, I had plans for my life that included a husband, children & a fancy corporate job. Now in my early 30’s, I don’t have a check against even one of those things. Instead, I have done corporate catering, learnt Hindustani classical music in a traditional guru-shishya parampara set up for a few years, become a Grand Master in Reiki, had my own restaurant, trekked in the Himalayas for three years in a row (and counting), I currently run a barkery for dogs… all the while swaddled in the fuzzy love blanket of family & friends. I am now a firm believer that life’s plans for me will always be better than my plans for my life. My 30's have been super fun. I learn something new everyday! I am growing now as a person, more rapidly than ever before.I love to look at things with a dash of humour and recognize life for the comedy circus that it truly is! Nature, food, dogs, friends & family make every day special. People who work in canine welfare come across rescued/abandoned mutts almost every single day. Each of them is special, with their own quirks and the unbeatable spirit they all possess to get over all odds, to live a happy life. We try to detach ourselves emotionally as best as we can, to protect our hearts. But there is always one dog, who breaks through our best defenses; there is no reason why this happens, it just does. It was a bright sunny Saturday afternoon spent picnicking in Cubbon Park with Calvin, Sasha, a few canine friends and their human companions. When we were returning home, happy with the world, I got a call from my friend Santosh. 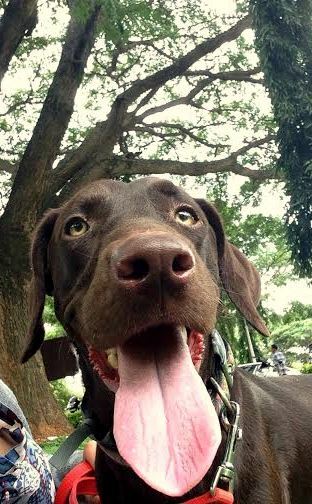 He had found a chocolate brown Labrador wandering the streets near his home. He said that he looked scared, a little skinny and seemed to have some skin infection on his hind legs but was otherwise friendly. I immediately sent the picture to a WhatsApp group that I have with Melissa, Sanjana and Anoopa; three ladies I work closely with. A kennel was arranged for this boy at the CUPA Trauma Center, Hebbal. I went over the next morning to meet him. He looked uncertain of his new surroundings, the cacophony caused by the other dogs barking their welcome to me compounding his fear. All the emotions he felt, danced nakedly in his bright amber eyes. I entered his kennel and sat down. Without hesitation, he climbed onto my lap. He was panting, shivering, he was stressed. As I held him close, his breathing evened out. I felt his muscles relax and he let out a low contented groan. This was it. He had imprinted himself on my heart. 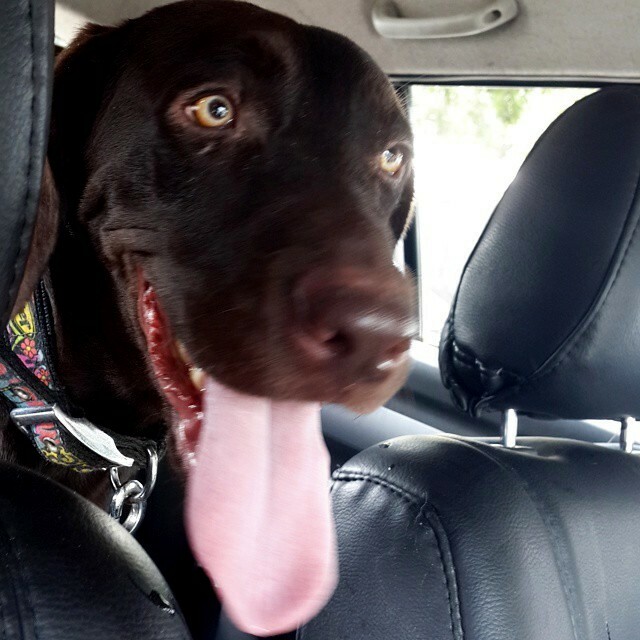 The colour of his coat, nose and his sweet disposition made it easy for me to name him – Snickers. He continued to stay at the Center for a week where I visited every day. His blood tests came clean, he didn’t have any infections and his organs were functioning well. He was trying to be friends with other dogs but was mostly nervous around them. Most dogs by now, settle into the routine of life in a shelter. Some sensitive ones like Snickers, don’t do too well. He would look to me with such desolation in his eyes when it was time to say goodbye, that it broke my heart every single time. At the end of a week, CUPA had to let go off a few kennels at the Trauma Center and the already limited space became scarcer. Most of the dogs were moved to the other Centers. Snickers came home with me for foster care. Snickers on his way to our home for foster care. The only time he rode on the backseat of my car. My little Godmother Sasha, aided by her trusted sidekick Calvin, tried every trick in the book to bully the newcomer. Snickers remained unperturbed, unprovoked and had eyes only for me. If I went to the bathroom, he would sit patiently outside till I emerged. If I sat down to have a meal, he curled up near my feet. He needed to go to the vet everyday to get a course of antibiotic shots for his skin infections. He would sit on the front seat of the car with at least a paw on my lap while I drove, constantly trying to inch his entire body onto my lap. He never made an attempt to get on the bed as Sasha considered it her personal fiefdom. He curled up on his mat next to the bed by my side, sitting upright as if jolted by electricity if I went towards the door of either the bedroom or the bathroom. He would dance on his hind legs at the mere sight of his leash. After walking two sniffing machines also known as beagles, walking briskly with this athletic boy gave me much joy. In our gibberish dog talk, I’d often tell him that when he grew up, we would co-author a book titled “The SnickWick Papers”. He didn’t care about the words that came out of my mouth; he continued to gaze lovingly up at me with his beautiful eyes and an indulgent smile. Calvin, Sasha and Snickers. Slowly learning to be friends. Sleeping and love for ice cream being bonding factors. Snickers, the finest stalker there ever will be. All too soon, came the bittersweet moment when an adoption screening for a foster child comes through. It was an ideal home for him and it was time to say goodbye. As I walked quickly away from the gate after dropping him off, I felt big fat tears roll down my cheeks as I tried hard to ignore his confused barking. This was his bright shiny future, I told myself. This was his happy ending. I would visit him when he had settled in. Saying goodbye before sending him off to his big, bright, shiny future. Three days after that, I got a call from his adopter. He was looking a little unwell, wasn’t eating properly, was disinclined to climb stairs and didn’t seem interested to go for a walk. The next morning, he was taken to the CUPA clinic where they suspected Canine Distemper. The breath caught in my throat as I tried to stay calm. I asked for him to be brought to CESSNA Lifeline in Domlur, where they had a Distemper Kit. I was on my way elsewhere but turned my car and drove straight to the hospital. 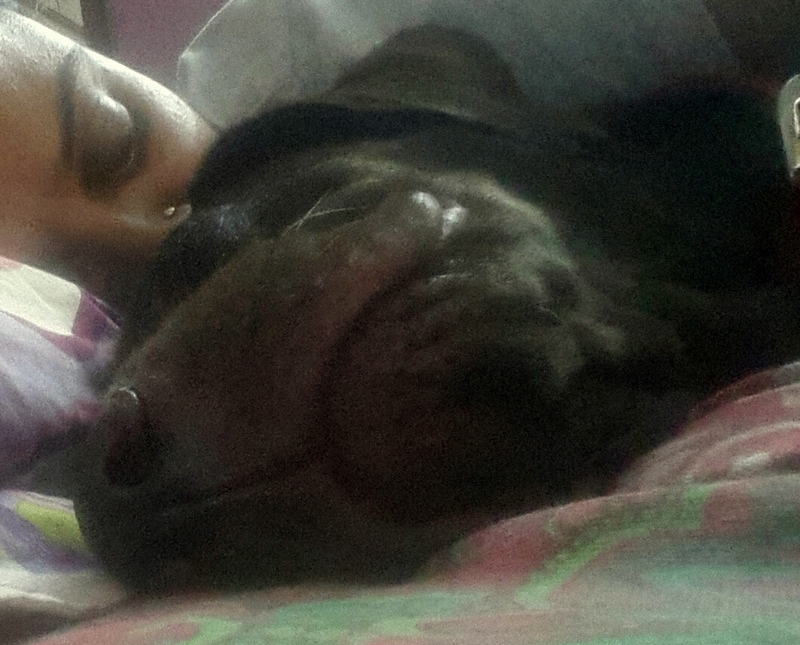 Sanjana happened to be there to collect medical reports for her foster dog and I was glad to have her around. The minute Snickers saw me, he demanded to climb onto my lap. I sat on the floor, only too happy to oblige. After an interminable wait of about an hour, the test was done. It was positive. While Canine Distemper is fatal, there have been cases of several dogs that have pulled through. 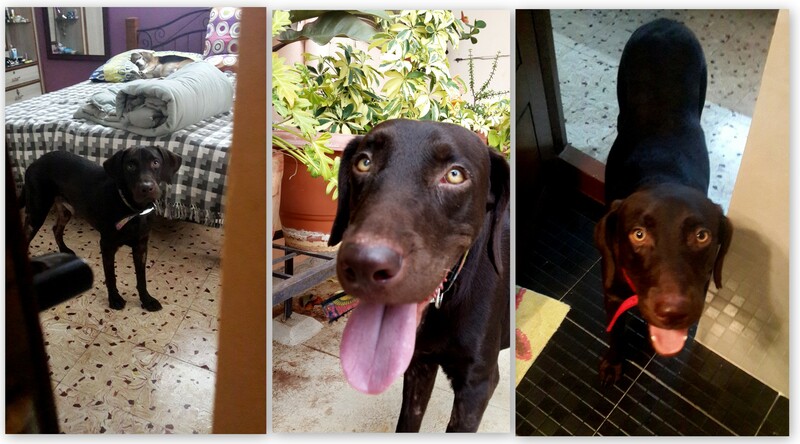 Sanjana had fostered a Labrador Retriever very recently who had emerged from the same illness, unscathed. We took Snickers back in our custody; we wanted to give him every chance to fight this. We dug our heels in and prepared to battle. 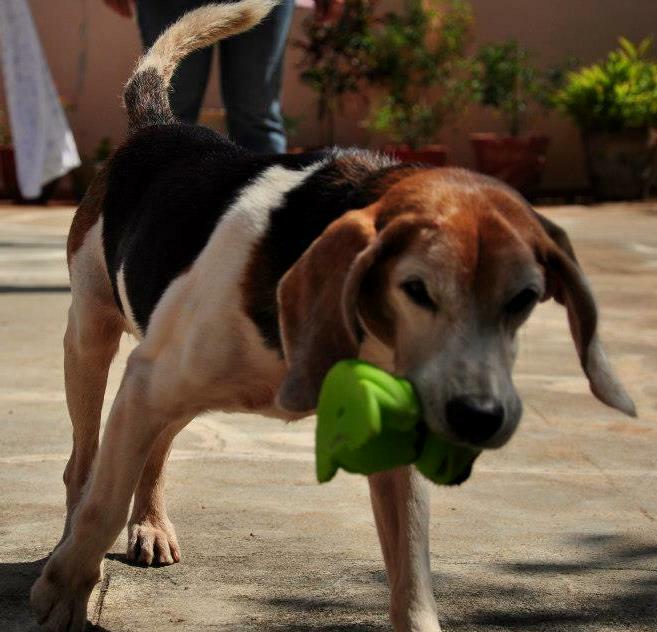 He was kept in quarantine in a room in the CUPA Adoption Center for a couple of days and then moved to Sanjana’s home. The vet visited him twice daily to check on him and give him his medication. We took each day as it came. We celebrated the clearing of the nasal discharge, we did a little mental jig when his eyes looked slightly clearer than it did the previous day. His heartbeat was normal one day, there would be an arrhythmia the next. The vets at CESSNA, the vet who was administering his medication and my vet of over 20 years said that there was no reason to give up hope. In the midst of all this medical talk, the Snickers Magic that I had long been bewitched with, slowly started to take other victims. How could one not help but fall in love with a boy who was so gentle, loving, trusting and who made one of the best lapdogs in the world? Cuddling into people’s laps made him and the owner of the lap feel much better. A week on and our hopes had slowly started to turn into a firm belief that he was going to make the bend. And then, he stopped eating. IV fluids were administered, sludgy food fed through a syringe. 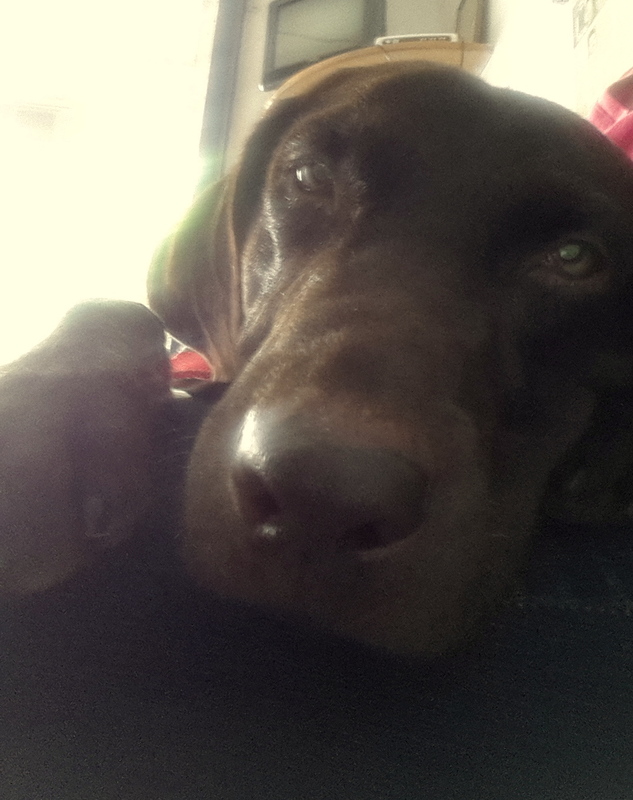 His demands to cuddle up on any available lap continued. On September 27, 2014 (Day 9 after diagnosis), it came. The first massive seizure, without warning, a bolt out of the blue. The dreadful virus had begun its attack on his nervous system. The time had come to put the weapons down and let our boy go in peace. I was far away in Meghalaya when the call came. 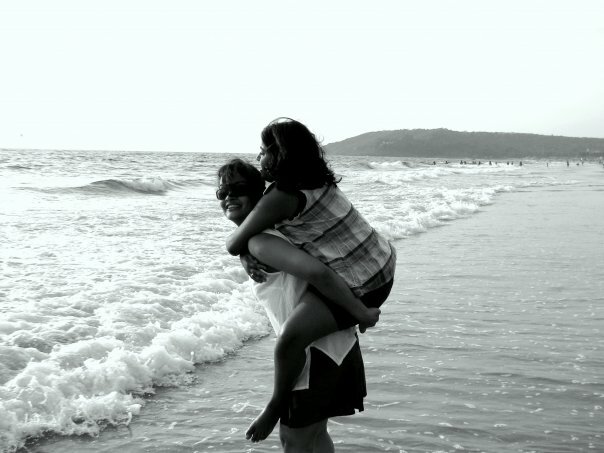 I was helpless but I knew he had loving arms to hold him while he made his journey. 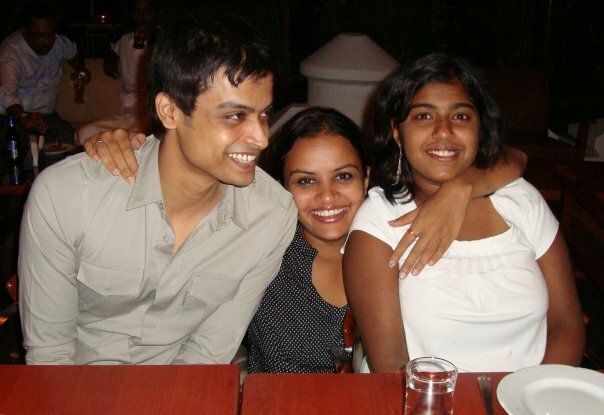 I will remain eternally grateful to Anushree for all the love he got while he was at the Trauma Center, to Melissa for taking charge and giving him a fighting chance when he was diagnosed with distemper, to Sanjana & Anoopa for lovingly administering his medication and giving him plenty of hugs, to Santosh for laying him down in his final resting place. We are his family, the ones who will go through the rest of our lives with a giant space in our hearts where a gentle, chocolate coloured, amber eyed boy will eternally rule. It was the year 1993. At the age of 13, Life gave me one of the best gifts yet. A baby sister. 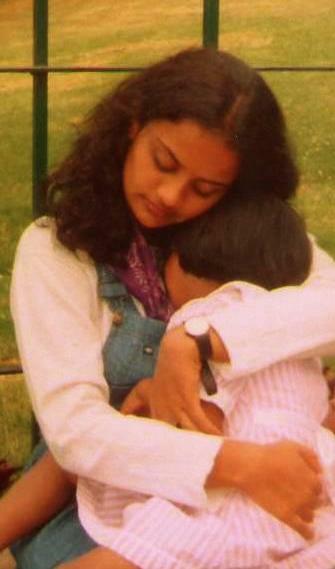 I did not know it then but my relationship over the years with this little baby was to encompass sisterhood, motherhood and the deepest friendship of my life. I remember that time when she was around two years old. She was swinging joyfully on the little red plastic swing that our father had hung from the ceiling in our living room. She slipped off, fell and landed on her head. The skin near her hairline broke and she bled and bled and bled. More from the sight of blood than the pain, she was howling with all her might when I walked into the house after finishing school. My mother’s thinking faculties were numbed with the fear of how bad the wound looked. As soon as the little one saw me, she came straight to me and asked to be held. My uniform was soaked through with her blood. Maybe a year later, she was climbing on the gate of our house. She was demonstrating to her little friend that it was very safe to do so and the best view of the street was from the top of the gate. The demo didn’t go as planned. While giving the speech about how safe it was, she lost her footing and fell down. She landed on her chin which split and there was the gushing of blood again. I ran towards her to scoop her up in my arms. Needless to say, I was soaked to my skin with the amount of blood that poured forth. A couple of more years passed by; I was in college now. I was returning home in an auto. As the auto turned into our lane, the little mink ran across the street while playing. The auto screeched to a halt. I heard her scream. I jumped out of the auto (fell flat on my face in the bargain). There had been impact. The metal edge of the auto had just missed her eye. And yes, there was the profuse bleeding again. She needed stitches every single time. Given her fear of needles, the doctor at the ER managed to hold the skin together with some kind of fancy glue. The scars remain. I am the custodian of the stories behind each of the scars much in the same way that I was the custodian of her pain at the time that she got hurt. I think there has been enough of her blood on me over the years to bring home the point that we may not share the same DNA but we are totally and completely related by blood. More importantly, we are related by stories, a common history, by tears, laughter, memories that we have created together and love. Often times, I have been asked, “Oh, she’s not your own sister?”. What do we mean by “own”? If it is a word used to ascertain a sense of ownership, then even my brother is not my “own”, my parents are not my “own”. It would be very arrogant of me to believe that I can own any living being. Are they my “own” because we belong to each other? Then my sister is my own as much as the rest of my family is. In fact more so; I did not have a choice with the rest of my human family but I did with her. Many people have told me how great my parents are for having chosen to adopt a child despite having two of their “own”. To them I quote Kahlil Gibran. “Your children are not your children. They are the sons and daughters of Life’s longing for itself. They come through you but not from you. And though they are with you yet they belong not to you.” Yes. News Flash. Nobody is your own, not even your “own children”. Our family began when my parents adopted each other. We each have so many relationships that are born and sustained out of love, with our friends, dogs and cats. Why then are we so hung up about being related by DNA when it comes to having children? My sister does not look like me and she’s the better for it. Who would WANT to inherit the big nose and broad forehead that have come to me because of my genes anyway? But there are times when she cracks people up with her dry sense of humour… when she infuriates her friends with her ability to switch off completely from her surroundings… when she picks up a puppy in a precarious condition off the street and arranges for a safe home for it… when she fearlessly and confidently tries out things that stir her passion… when she pig headedly stands her ground when she believes in something… these are the times that I am told she is EXACTLY like me. Does anything else matter? I wonder when the fascination for you began. Maybe when I had come to Manali at the age of 15? I got a brief glimpse into your magnificence and I was blown away by you. I encountered you several times over the years… at Shimla, Dharamsala, Dalhousie… and my fascination continued to grow. I remember the way you smelt, clean, fresh, you smelt of how I would imagine Life would smell. I remember the way the blood would rush to my cheeks in your presence. I felt light headed, giddy, giggly, happy. I had to know you better. When I turned 30, I knew that the time had come for me to get intimate with you. I would have one passionate, clandestine affair for a fortnight, hopefully that would satisfy this curiosity that had been growing within for so many years.. Discovering more of you, sinking myself deeply into your presence. Save for a few close friends, nobody knew that I was coming to you alone. Your reputation preceded you. You are known to be savage, wild. You are not known to many and what is unknown will always be feared. But there was a strong faith within me that you would treat me well, you would treat me kind. I had to travel all the way to Nepal for this to happen. And what a journey it turned out to be! There were days when your savagery made me fear for my life and from that fear was born a trust that I would always be safe with you. I was stripped off of every role that I play in my everyday life. I was no longer a sister, daughter or friend. I was naked when I was with you, I was me. I was alone in your midst and I felt the most secure, the most taken care of, the most cherished. When I sat with you, alone at night, staring at the misty moon and the silhouettes of old trees, I felt complete. The thing I cherish most about my time spent with you is the silence. With you, there is no need for tiresome small talk, the chatter of inane conversation. It is in your presence that I learnt to truly enjoy my own company. What I thought would be a one time fling, ended up becoming the deepest relationship in my life. And I return to you. Every year. I yearn for you when I am away from you. I long for your embrace. I journey far to get to you every year and in covering this distance, I travel deeper within myself every time. Others come to you to seek adventure, the thrill, the rush of adrenaline. I come to you for love, sanity and silence. Others are filled with pride that they have been to The Himalayas, I am only filled with awe and humility. October 16, 2010. 7:37 a.m. Approx. 5200 m above mean sea level. 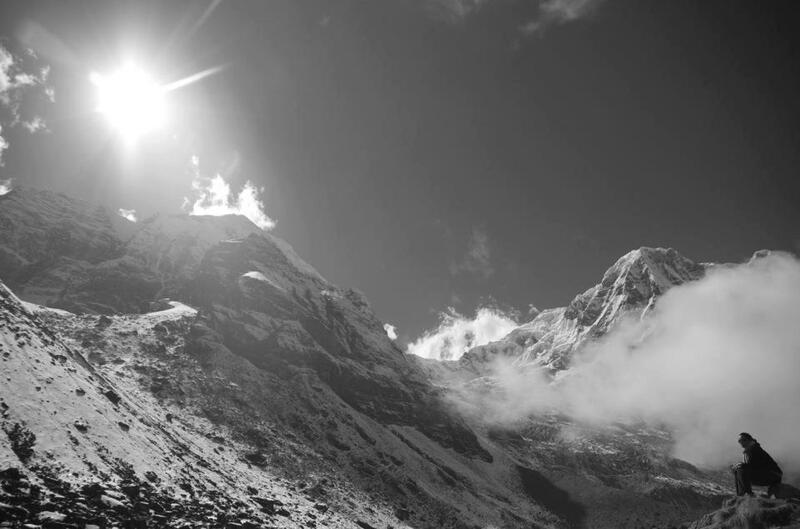 This picture was taken en route to the Thorong La Pass, Nepal. It was the last day of a 15 day trek. All exhaustion was forgotten in the presence of this magnificence. Grateful, humbled, awed, honoured, proud, overwhelmed. November, 2012. 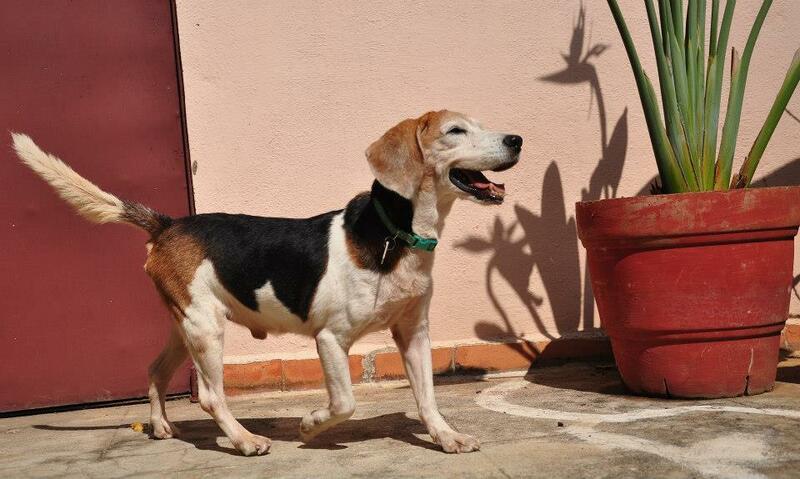 Twenty eight beagles were rescued from Advinus Therapeutics Pvt. Ltd. (a Tata Enterprise) in Bangalore. All on average ten years old, they had spent their entire lives in tiny cages while experiments of an unknown nature were conducted on them. When they were released, there was an urgent appeal to adopt or at the very least foster these dogs. Since they were coming out of a sterile laboratory environment, it was not advisable to keep them in the animal shelter for too long for fear that they would contract infections. I went to the pound and without knowing what I would do, I brought home a dog, whose only identity was a number -1053. I didn’t know if I was going to keep him forever or until we found him a home. When I saw him, he was stuck to the back of his kennel, staring at me with eyes as black as the night. I knew I had to get him out of there, I HAD to do something. He was unlike any dog that I had ever encountered in my life. Tongue hanging out of his mouth in stress. Lumps and bumps all over his legs. Skinny. Severe teeth and gum infection. He had a chemical stench emanating from his body. Back bent with no muscle strength to support his skeletal frame. Two hairless rings around his neck, suggestive of him being cut open at some point in his life. Everything was overwhelming for him. He didn’t know to climb up and down stairs, he didn’t know to recognize anything as food other than Pedigree even though he barely had teeth to eat it. I decided to name him Phoenix. He stayed with me for a week, during which time it became obvious that he had never been around another dog in his life and being around my dog, Calvin was causing him tremendous stress. Despite the fact that Calvin is a peaceful dog, Phoenix would pace up and down anxiously if Calvin was anywhere in the same room, not sitting still for a single moment. It became imperative for me to find him a more suitable home where he could heal from the scars of his past. The first time Phoenix picked up a toy to play with, was a day of great celebration, he was learning to get past his past and be carefree. Medical examination showed that his liver was producing three times more enzymes than what was normal. I wanted to make sure that he was treated for that, that he was physically fit before finding him an adoptive home. I moved him to my vet’s boarding kennel where we ensured that he never had to be in close proximity with another dog. He got to roam free in the sun through the day and would sleep in his spacious kennel at night. I visited him at least once a week and I could see improvement. His appetite had improved, he was gaining weight. More importantly, he was not stressed out around humans. He would even shyly come close for a pat on his head. He was learning to be comfortable around other, quiet dogs, although being around males still made him very nervous. Phoenix on my terrace. He was happiest being outside in the sun, something that he was denied as his entire life was spent in a cage. He was visiting after a month at the vet’s boarding place and there was already a remarkable improvement. After three months, it was time to find him a home. A friend of mine from college reached out to me and offered to adopt him. He was finally going home; a home like one that I had dreamed of for him but one that I didn’t know was possible. 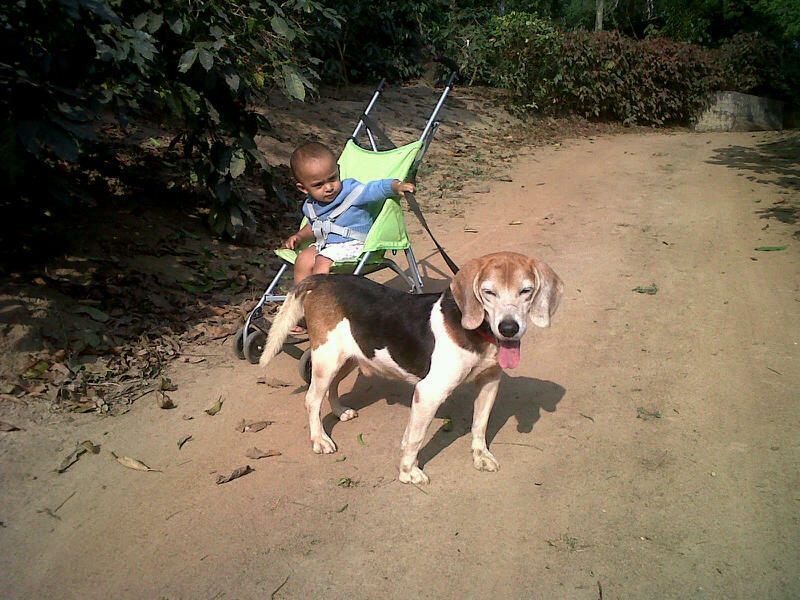 She was going to take him to her estate in Coorg, where the two existing dogs she had were both female. (What are the odds??!!) He would have wide open spaces to roam around in, plenty of sunshine to soak in and a family that would take care of him in the winter of his life. In helping Phoenix heal, I changed as a person dramatically. It is easy to fall in love with a happy, healthy dog but as I fell in love with an old, broken, stinky dog, I felt my heart grow bigger. It is true, “Saving one dog will not change the world but surely for that one dog, the world will change forever” and might I add, the world of the human changes forever too. Thank you Phoenix for leaving your footprints pawprints in my life, you are definitely the better part of my growing up in the thirties. Duke : A story of rebirth. I was taking my father for a trek in the Garhwal Mountains in 2011, he had turned 60 that year and this was his birthday gift. 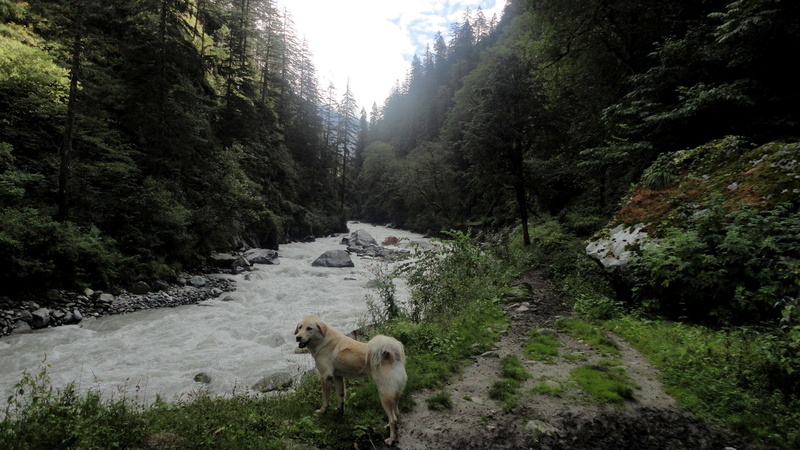 We were to start our trek from a tiny village called Sankri in Uttarakhand. We ate an early breakfast of bread, eggs & chai and set out. 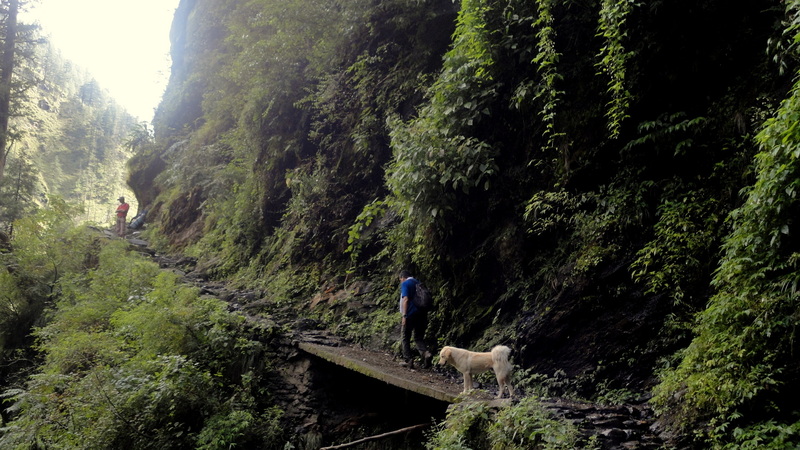 The first day of a trek is always special. Spirits are high, muscles are not aching, and you’re abuzz with the excitement that you’re finally on the trail after months of planning and preparing. 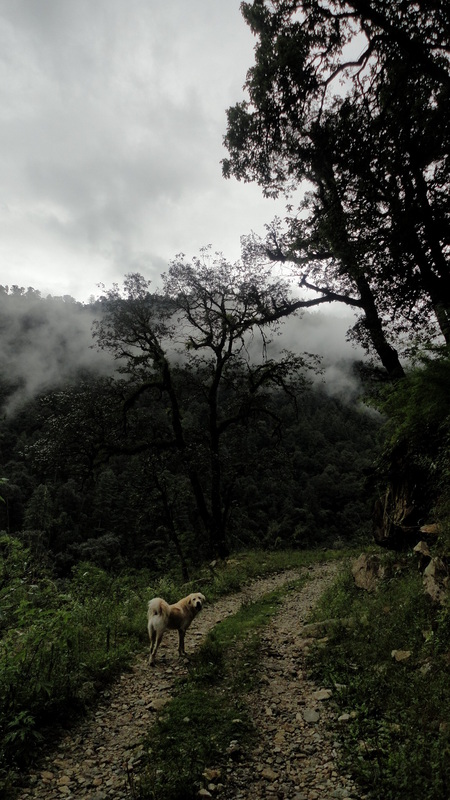 This was a post-monsoon trek but given the change in the climatic conditions the world over, there had been a heavy downpour the previous night. The path leading into the forests had huge puddles of water. Heavy mist hung in the air. There were gorgeous, lush green trees on either side. We had hardly walked a few meters outside the village when I first saw him. He was standing in the middle of the path, facing me. Tall and lanky, he had a beautiful white coat on with swirls of beige all over it. He languidly started walking towards me with a slow swagger. As he got closer, I noticed his eyes. They were the colour of melted caramel and they looked warm against the cold, damp surroundings. He had such an easy, friendly demeanour about him. I couldn’t help but smile, I think I may have let out an involuntary giggle. That was the only encouragement he needed. The swagger quickly turned into a full throttle run as he came charging towards me. He pounced on me trying to kiss my face, his entire body quivering with the sheer excitement of encountering somebody who was interested in him. I turned to look at my father who was also smiling at the unabashed display of affection. Wow, my father approved? Super!! And just like that, I had found myself a travel companion. He walked with us every step of the way over the next week. Sometimes he led the way. He would walk ahead and look behind to ensure that I was following. If I had stopped to rest or take pictures, he would sit on the path and wait till I reached him to continue on. 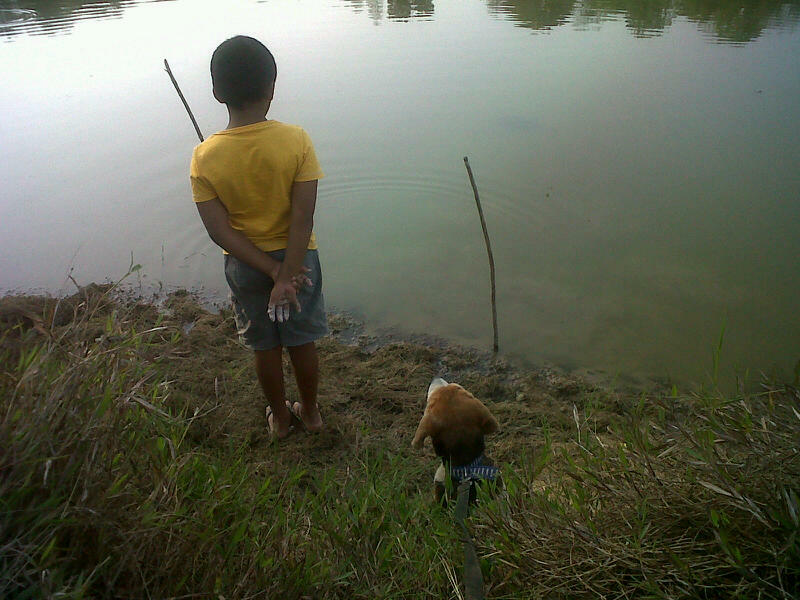 The only moments when he would run away from me were when he saw some noisy monkeys on the trees. He would go charging off the path, into the forests to give them a good shouting, as if asking them to stop monkeying around. 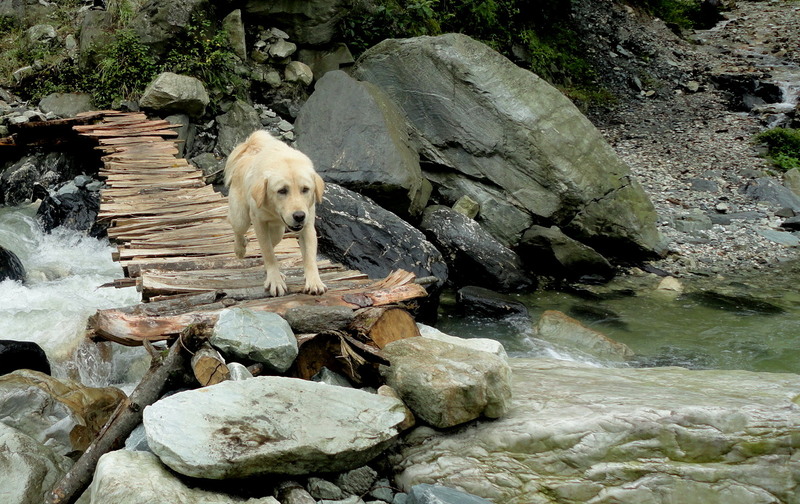 He was especially protective of me when we had to go past a landslide area. He would walk a few steps and then come back to me as I gingerly put one foot in front of the other over a path strewn with loose stones and rubble. 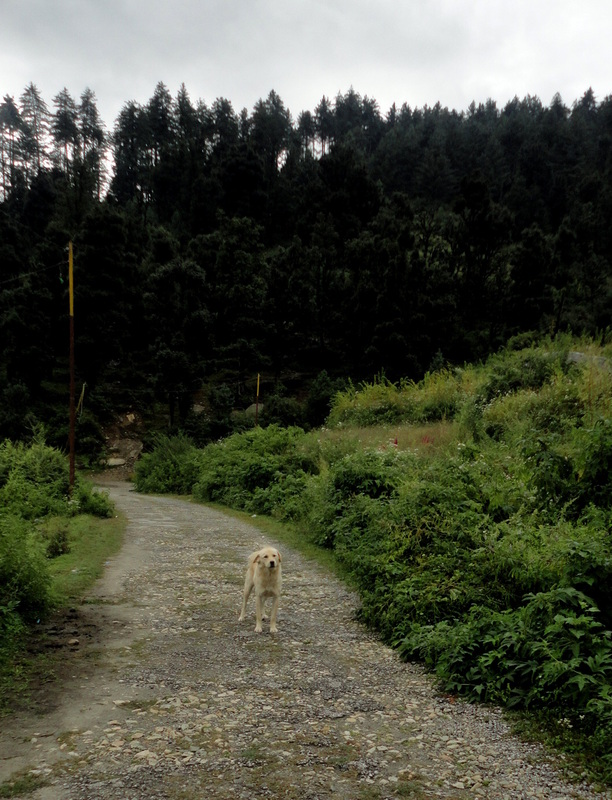 There was another trekker slightly ahead of me; he even tried to push her aside to make space for me to pass. Not a very gentlemanly thing to do I agree, but he was so smitten by me that all social niceties were forgotten. His smiling happy face was the first face I saw every morning as I stepped out of my tent, I’d imagine he slept right outside the entrance waiting to see me appear. 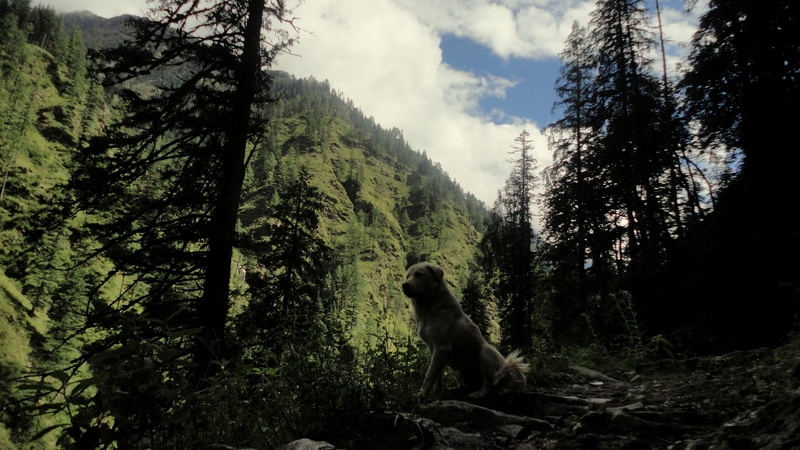 I shared my food with him, a few rotis with every meal and biscuits when on the trail. 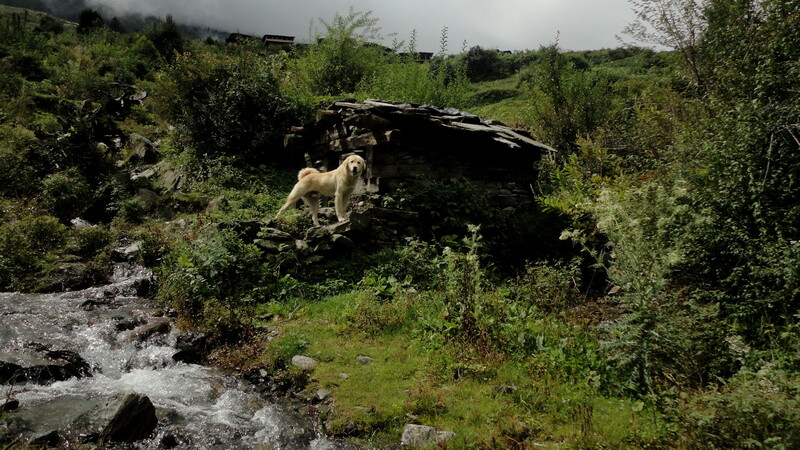 When we got back to Sankri on the last day after completing our trek, I went into the tiny lodge to leave my bags. I dreaded the moment when I would have to say bye to him. When I came out of the lodge, he was not there. I looked around the village a little bit but didn’t find him at all. I waited at dinnertime for him to appear but I was disappointed. Just as quickly as he had bounded into my life, he had disappeared. I guess he didn’t want to go through a teary goodbye. I hope he finds kindness in the mountains, somebody who would love him the way I did. I do know that my gorgeous travel companion will forever remain free spirited and wanderlust, at home in the Himalayas… probably all the reasons why we were kindred spirits for a moment in time. All of us hung out like old friends should. Chatting, laughing, singing. Alcohol was a part of the party and as the evening progressed, several of them at the party started to get drunk. I was on my second drink. (Remember that I was NOT drunk, it is important.) It was beginning to get late. I left the party which was happening in the living room and went to the adjoining dining area to serve myself some dinner. One of my male (not single) friends came to make sure that I would eat well. As I was serving myself food, he put his arm around my shoulder and said, “Please eat properly, don’t be shy to serve yourself.” I smiled in acknowledgement. Slowly the arm slipped down from my shoulder to hold me around my waist. He continued to make small talk. I stiffened up but told myself, “Well, no need to overreact, he’s a friend. We’ve known each other a long long time.” Even before I had completed that thought, his hand went up to fondle my breast. My sari palloo provided the required shield against anybody who might have looked in our direction. I froze. The smile I had, to keep up with the small talk, also froze on my face. I was incapable of moving for a few seconds, a few minutes, I don’t know. All thought drained out of my brain. I was screaming inside but I felt unable to move my limbs. Fortunately, another friend came over to serve herself dinner. The hand moved away from my breast. I immediately returned from my shell shocked state. I put my plate down, said bye to everybody and left. I drifted in and out of a very restless sleep that night. I didn’t speak to anybody for most of the next day, still trying to wrap my brain around what had happened to me. I was shocked by the thoughts that came to my mind. Had I done something to attract this? Had I given out the wrong signal? Had I behaved in a way that made a man think that it was okay for him to touch me inappropriately? What if I was not single and had a boyfriend/fiancé/husband with me at the party? Would things be different then? I was horrified by the way that I felt. Yes, I felt violated. But I also felt guilty. I, the victim in the situation, felt very very guilty. Would people believe me if I told them what had happened? The friend was well loved among everyone. As a slightly older man, everybody looked up to him. I felt very alone. Fortunately for me, I have a few friends in my life with whom I can talk to irrespective of how I feel about myself. They knocked some sense into my head. They snapped me out of the whirlpool of misery that I found myself drowning in. Feeling empowered again by a strong dose of loving support, I decided to tell everybody present at that party about what I had gone through. Men & women alike, I told them all. I had nothing to be ashamed of. I had not asked for it. It was not my fault. Everybody expressed shock. Everybody on their own time confronted the friend who admitted to what he had done but blamed it on the alcohol. Everybody was enraged. Everybody soon forgot about the incident. Everybody decided to continue to be friends with that man while shuffling their feet and staring at their phones every time they encountered me. When one takes a stand for what is right, it is easy to do so against a stranger. It takes true character to take a stand against a friend or a family member. Little wonder then that a majority of sexual crimes go unreported as they are mostly done by a known person. Can a woman be expected to be brave and courageous and speak up against injustice done to her when society as a whole provides feeble support based on who has committed the crime? I have been blessed to have a few friends and then subsequently my family in my corner. What about the women that can’t even have that? I am an educated, independent woman. Yet when a crime was committed against me, I lost my voice, I felt terrible about myself. What kind of conditioning takes place in this society that made me feel that way? The man in question is also educated, works in a multinational company. What made him think that he could do what he did, that despite being in a committed relationship a single woman is fair game? There were other women present at that party. Was their loyalty to their men’s decision so strong that they didn’t feel compelled to express solidarity with another woman? Remember, I was in a sari, driving my own car, was indoors after dark, was sober and was among friends that I had known my entire life. And yet it happened to me. If it hasn’t already, it can happen to any one of you. Trust your instinct, it’s the strongest tool we women have and it is the weapon we use the least. Talk about it, it is the best way to heal. Even if there are few to feel your pain, still, talk about it. While it is shameful that something like this had to happen, there is nothing to be ashamed of. I did NOT ask for it. It is NOT my fault.